An illustration of a particle collision at CERN’s Large Hadron Collider. Credit: “Phantom of the Universe". While some celebrated Halloween last night, other people were celebrating the first Dark Matter Day. Yes, Dark Matter has its own day, though it’s unofficial, but is global. Dark Matter Day was organized by the Interactions Collaboration, an international network of particle physics laboratories in Europe, North America and Asia and includes Canada’s TRIUMPH laboratory. 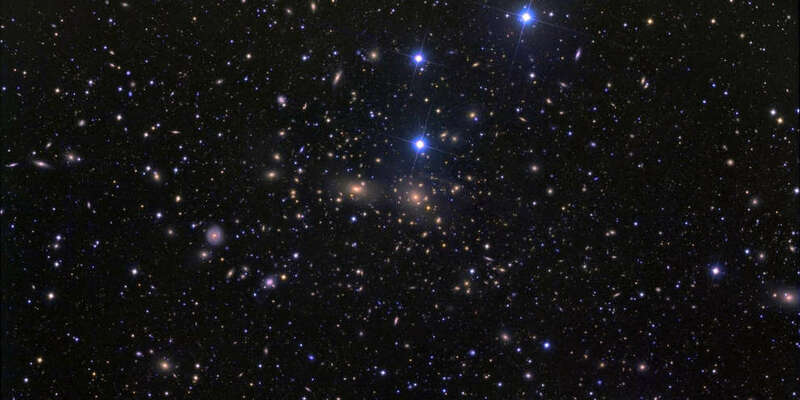 The Coma Cluster of galaxies. Credit: SnoLab/Dean Rowe. Events were organized globally including in Canada. One of those events was a live webinar by the SNOLAB in Sudbury. Below you can watch the presention and learn more about dark matter. 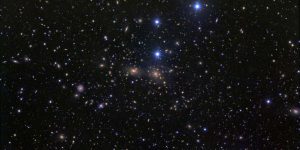 To coincide with the first Dark Matter Day, a new planetarium show was produced called Phantom of the Universe, the Hunt for Dark Matter. It was Michael Barnett, a physicist at the Department of Energy’s Lawrence Berkeley National Laboratory, who had the idea to create the new show. The 25-minute planetarium show is now playing globally, including in Vancouver at the HR MacMillan Space Centre.